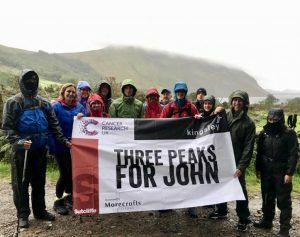 A team led by Kingsley legal and property recruitment firm, successfully completed the gruelling Three Peaks Challenge, smashing their fundraising target for Cancer Research UK, in memory of Old Boy John Sutcliffe. In pretty terrible conditions, including temperatures of -6 degrees Celsius, 30 miles-per-hour winds, torrential rain and even sleet, the famous endurance challenge took place on Thursday 13th September. Thirteen brave and hardy souls from Kingsley, Sutcliffe Engineering, and various friends, clients and associates took on 26 miles of rough terrain to climb the three largest mountains in England, Scotland and Wales (Ben Nevis, Scarfell Pike and Snowdon). Having left Liverpool at 7am, the team started their climb of Ben Nevis at exactly 6pm, and despite a couple of the team being forced to drop out the core group successfully negotiated the peaks and completed the descent from Snowdon at the following evening. In total, they climbed approximately 3,000m – the equivalent of walking one third of the way up Mount Everest. The efforts of the team have so far raised more than £5000, including gift aid, all of which will be donated to Cancer Research UK. Donations are still being accepted online at www.justgiving.com/fundraising/sutcliffethreepeaks.